So this is my workspace where all the magic happens, haha! Okay, so this is where I spend a lot of my time, besides in-front of the camera, creating content for my blog and YouTube channel. When I'm sitting here I like to have visual "props" to give me that extra bit of motivation. Let me walk you through what I have on my desk (p.s. it's actually a chest of drawers) and tell you why I have what I have on it. Okay, as you can see I have an Apple iMac computer which is my absolute baby! It's the Retina 5K 27-inch which is super expensive but so worth it and I love it so much! It looks super stylish and has all the latest software available to me for editing videos (iMovie/Final Cut Pro etc) and photos. It's also super fast and has lots of storage space, but of-course, I have a few external hard drives too because I film in 4K and take high quality photos. 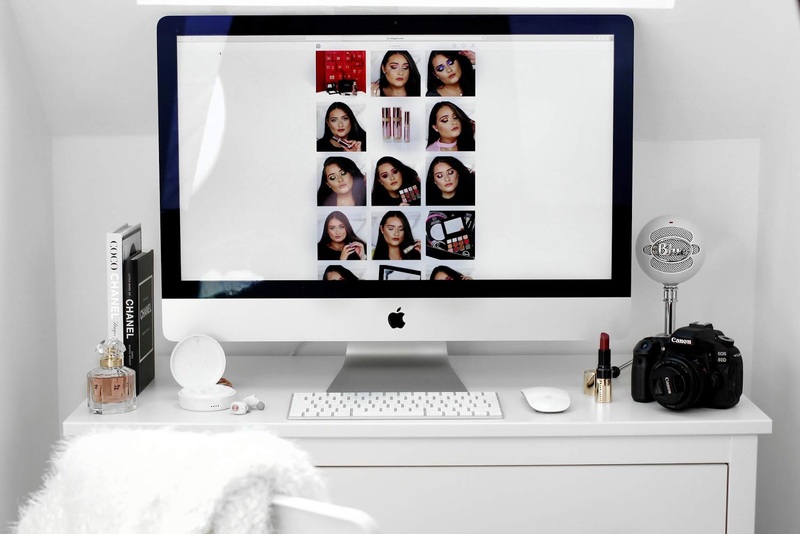 Now my iMac is what I use to edit all my videos and write blog posts and that's motivational enough but, I also LOVE to have a few other things around me that make me feel good and give me inspiration - I like to call these "props". My Chanel books give me inspiration to work harder because she is one of my favourite designers, plus they look aesthetically pleasing. I also like to keep my favourite fragrance of the moment on my desk and right now it's Guerlain's Mon Guerlain. I also keep the lipstick I'm wearing so I can top up throughout the day and today it's Bobbi Brown's 'Bond' lipstick. Okay so that's all the little aesthetically pleasing "props" I like to keep on my desk, but I also have some tech-y bits on here too that I need to create my content. First, I have the camera I'm using for filming YouTube videos (subscribe here to my channel) and currently I'm using the Canon 80d with either a 50mm or 18-55mm lens. This is also my little baby! On my desk I keep my Blue Snowball mic which I use for my voiceovers. I also have my Sudio earphones which are great for editing my videos or just listening to music whilst writing notes. I actually have a discount code for 15% OFF. Just enter code 'jodiecaughey15' at the checkout! So yeah this is my workspace and where I spend a lot of my waking hours! I love it so much and hope you do too or maybe it gives you some decor inspiration for your own little work station.